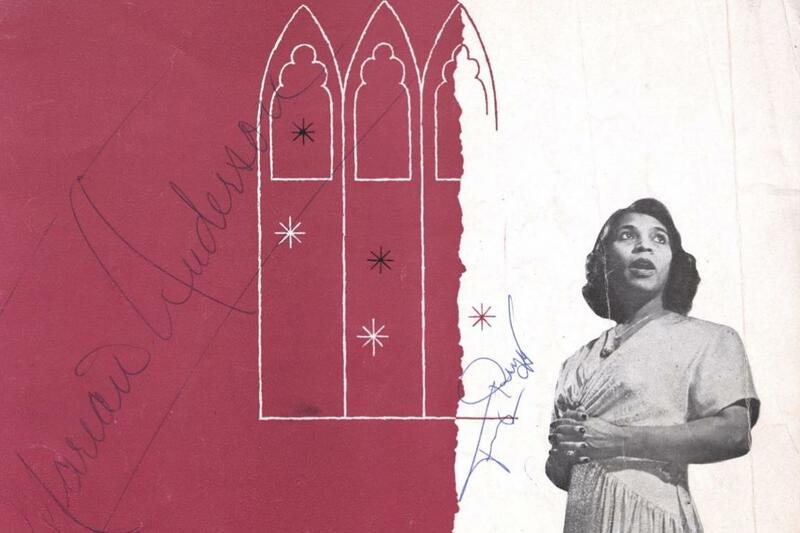 Promotional and souvenir program autographed by Marian Anderson, Collection of the Smithsonian National Museum of African American History and Culture, Gift of Jackie Bryant Smith, 2010.66.153. The great operatic contralto Marian Anderson is most often recalled for her brave and stirring performance from the steps of the Lincoln Memorial in 1939, after the Daughters of the American Revolution refused to allow her to sing from the stage of their Constitution Hall because of the color of her skin. Less well remembered is the extraordinary life she led before and after that moment, in a career that took her from Philadelphia, the city of her birth, to New York City, the White House, and performances before royalty and in the great opera halls of Europe. And yet, like many African American singers of her era, Anderson faced discrimination in her own country. After graduating from high school, Anderson applied to the all-white Philadelphia Music Academy, which refused to admit her. Undaunted, she continued to pursue her dream and, when she was 23 years old, Anderson beat over 300 competitors for the opportunity to sing with the New York Philharmonic Orchestra. In Europe, South America, the former Soviet Union, and elsewhere, she captivated audiences with performances in multiple languages, including operatic arias and songs drawn from the classical canon. She also included traditional African American spirituals in her repertoire, sharing this important art form with the world. Marian Anderson's broad repetoire included African American spirituals, bringing the important an oral tradition to the world. Marian Anderson Sings Spirituals album cover. Recorded by Marian Anderson, 1956. Collection of the Smithsonian National Museum of African American History and Culture. By 1939, Anderson was an international sensation. Yet, when Howard University invited her to perform in Washington, D.C., the Daughters of the American Revolution denied her access to DAR Constitution Hall, the only auditorium large enough to accompany the throngs of anticipated fans. It would be Walter White, executive secretary of the NAACP, as well as Secretary of the Interior Harold Ickes and others who would seek to right this injustice by inviting her to perform at the Lincoln Memorial. In many ways, Anderson was an unlikely hero. Off the stage, she was quiet and reserved. When asked to comment on the Daughters of the American Revolution and their refusal to let her perform, she characteristically demurred—preferring to let her performance speak for itself. Photograph of 75,000 People Gathered to Hear Singer Marian Anderson in Potomac Park, April 9, 1939. Records of the U.S. Information Agency, National Archives at College Park, MD, online version available through the Archival Research Catalog #595378. It did. 75,000 people heard her sing that morning, and before her retirement she would enthrall millions more. She would make her belated debut at the Metropolitan Opera in 1955, tour the world on behalf of the United States in 1957, and sing for the inaugurations of presidents Eisenhower and Kennedy. Eventually she moved to Connecticut, and at the end of her life she traveled to Oregon, where she lived quietly, occasionally accepting well-deserved honors, until her death at age 96. The skirt and the decorative trim on the orange jacket were worn by Marian Anderson in 1939 when she sang at the Lincoln Memorial. In 1993, with Anderson’s permission, the original velvet jacket was remade using silk fabric. Orange tailored silk shantung jacket and black velvet skirt worn by Marian Anderson at Lincoln Memorial in 1939. Collection of the Smithsonian National Museum of African American History and Culture, Gift of Ginette DePreist in memory James DePreist. At the National Museum of African American History and Culture, we have many treasured artifacts and exhibits from Anderson’s storied life. There is one of which I am particularly proud: the ensemble Anderson wore on April 9, 1939, when she sang to the conscience of the nation. Although she wore a fur coat over her shoulders to fend off the cold, her jacket was bright orange with jeweled buttons that sparkled in the sun — a jacket befitting the icon she truly was. In 1993, with Anderson’s permission, the jacket was redesigned with new fabric and the trim that was on the original garment. We are honored to conserve and share the skirt as Anderson wore it that day. If you have only ever seen black-and-white footage of her performance, I invite you to come to the Museum, see Marian Anderson’s dress, listen to her voice, learn more about her career, and experience a moment that transfixed and helped transform the nation. Join us as we celebrate the life and achievements of a great American hero. Marian Anderson by Roger Smith for the U.S. Office of War Information, January 1943, Library of Congress, LC-USZ62-130313. Marian Anderson sings Star Spangled Banner at dedication of a mural, Office of War Information, 1-6-1943, LC-USE6- D-0079. Marian Anderson entertains a group of overseas veterans and WACs, 1945, Office of War Information, NARA ARC 535928.